Discovering untouched, gleaming winter landscapes is one of the most breathtaking experiences of the cold months. Plastic snowshoes are one of the most cost-effective ways to plunge into adventure off the beaten path. They minimize sinkage in snow and provide the wearer with enough stability to move around in the snowy element. Plastic snowshoes are classified according to user weight range, gender, and usage. 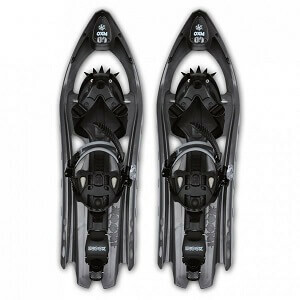 A wide variety of plastic snowshoes are available through renowned manufacturers such as Inook, Salewa, and Tubbs. Our product line also includes popular snowshoes by TSL. The days when snowshoes were made of wood and pelts are long gone. With the introduction of modern materials such as plastic, snowshoes weigh less and have much better stability. Plastic snowshoes are also substantially cheaper than their aluminum counterparts. For rising terrain, variants with heel lifts are also available. MSR's snowshoes in particular are designed for more demanding terrain. Snowshoes by other manufacturers such as Tubbs and Inook are just as effective. People differ in weight and pace because of anatomical diversity. That's why a variety of models are available for men, women, and children. Note: Although plastic snowshoes offer a convenient entry opportunity for this sport, untrained individuals should absolutely avoid areas with a high risk of avalanches.